Quality film and video from an aerial platform is almost impossible without some form of gyro stabilisation and more importantly, an experienced film pilot. Offering one point of contact that can handle all of your aerial filming requirements we own all of our aircraft and gyro stabilised equipment (including a KS8X2 Mini gyro). 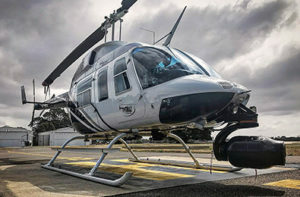 We have relationships with some of Australia’s top Aerial DP’s and regularly use both the GSS & ShotOver systems. Camera and lens combinations include the Red Epic Dragon or the Sony F55 & Angeniux 25/250mm lens. With a long history (& more importantly) a strong knowledge in aerial filming/photography we offer a true one stop (turnkey) Ultra HD filming option. Gyro stabilised 5-axis nose-mounted camera. The Gyro Stabilised Systems (GSS) C516 aerial filming platform complete with Red EPIC DRAGON or Sony F55 camera & Angénieux Optimo Style 25-250 lens. The 6K Ultra HD results are out of this world when combined with the rock solid stability of the GSS C516 or the ShotOver F1. Company owned KS8X2 gyro side-mount. Whilst a cheaper option than the GSS C516 or Shotover F1, the results are still exceptional for GV work. The mount can be fitted with any DSLR (eg. Canon 5D MII) or Sony EX3, Panasonic HVX200, HPX170, Arri Alexa M or even the Red Epic/Scarlet into our R44 helicopter within 10 minutes. *If required, use of our Convergence Design Nanoflash at no extra charge. 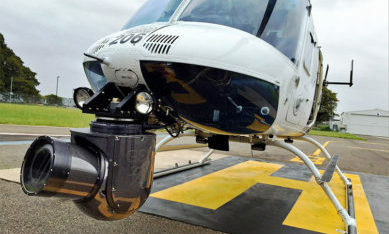 High definition 1080i camera permanently mounted onto the R44 helicopter in a fixed forward position. From the HD camera we then feed the signal into our Convergence Design Nanoflash… Using two internal processors, the Nanoflash records MPEG2 8-bit 4:2:2 video in either Long GOP or iFrame at data rates up to 160Mb/s (Long GOP) or 280 Mb/s (iFrame). We recommend MPEG2 Long GOP, 100 Mb/s. This filming option works well for survey & GV filming where zooming is not required. 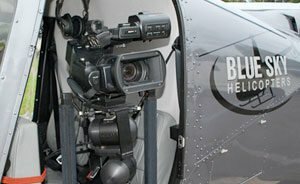 When it comes to shooting High Definition aerial footage for Film & Television, check out Blue Sky’s work utilising gyro stabilised camera mounts. The footage below is from the British TV series “Greatest Cities of the World” which Blue Sky pilot, Mark Fitzsimmons not only filmed but also directed all of the HD stabilised aerial sequences with the cinematographer.